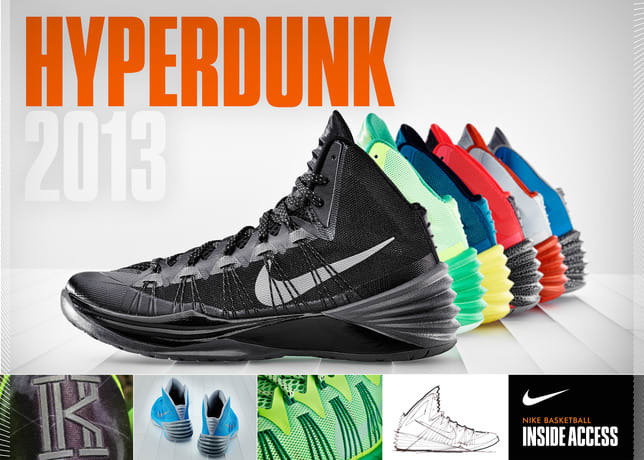 After receiving teasers, now the Swoosh has officially unveiled the new Hyperdunk 2013 entry. Set to debut in July, the Peter Fogg-designed basketball model showcases visible Flywire and Hyperfuse construction on the upper and comes fully equipped with Lunarlon cushioning. Above we see a variety of colorways of the forthcoming silhouette as well as sketches to show just how the sneaker came about. Look for the initial roll-out on July 20 through select Nike Basketball carriers.